So, you got an idea what features the company has to offer and key perks. Now, either way, you still can use Zenmate or choose any appropriate service from below mentioned VPNs. ExpressVPN stands in top VPN providers list for robust security and blazingly fast Internet speed through a secure tunnel encrypted by AES-256 bit encryptions. They have ultra-fast 1700+ servers placed strategically around the world and currently covering 94 countries which makes it the “BEST” Zenmate alternative. You can open blocked websites and services from anywhere anytime instantly via many places virtually. DNS leak protection, split tunneling, and kill switch are included in all plans. Apps are available for Android, iOS, Windows, Mac, Linux, Web Browsers, and Routers. Just like IPVanish, it also allows unlimited downloading as well as streaming. Users can switch without any restrictions because of their unlimited server swapping policy. ExpressVPN is a top-notch choice for security-conscious users as they don’t record traffic logs and connection history for ultimate privacy and peace of mind. Moreover, users can choose from various protocols such as OpenVPN, TCP/UDP, SSTP, L2TP, and PPTP empowered by 256-bit AES encryption for a desired level of security. They allow 3 simultaneous network connections with a single account, or you can configure router settings for protected surfing. Kill Switch secure you while interruptions to stop information leakage. On the other hand, split tunneling can be used for surfing specific sites through a guarded tunnel and the rest from your ISP provider. Premium plans come with a 30-day money back guarantee. 24/7/365 Customer representatives are available by live chat and email. NordVPN is another unique alternative to Zenmate to avail military-grade encryption and cutting-edge security technologies for bulletproof protection against hackers and surveillance. It packed with double VPN feature for extra security layer which encrypts your connection twice. In this, the first server (1st level) hide your real IP address, so the second server (2nd level) never knows your actual IP. In the end, you connect to the desired site without revealing your identity. It’s quite helpful for bloggers, journalists, and activists. Similar to the above mentioned VPN, it also comes with dozens of servers(3131) positioned in 60 countries, P2P ultra fast servers, unmetered traffic, and dedicated IPs for NordVPN users only. Their VPN software has a feature named “Anti DDoS servers” which shields against DDoS attacks along with stability checking system. Automatic kill switch restricts incoming/outgoing data immediately when your connection disconnects from the VPN network. So, in that way, no one can inject or steal your data. They also provide free proxy services which work out of the box – no signup required. NordVPN’s apps are available for almost all devices and operating systems. The user friendly client secures your privacy on Android, iOS, Windows, Routers, Chrome, and Firefox, etc. The best part is it can be configured on a variety of internet routers easily as there are detailed tutorials available for self-help. You can use on 6 devices concurrently whereas Zenmate allows 5. Their support staff helps you via live chat and email round the clock. However, there is also a large knowledge base where the company has discussed common problems and solutions. TunnelBear is a lightweight VPN software built in a way to deliver maximum ease-of-use with quick connect. Its software UI comes with minimal options to connect to any available server in seconds. Compared to the competition, they have less supported countries only 20+ but already helped 10 million peoples worldwide. Their award-winning network is quite faster and optimized for optimal speed. TunnelBear doesn’t create traffic logs of your online activities nor for internal use (Personal info) – so it’s one of the best VPNs you can trust and reckon for anonymous surfing. They use sturdy AES 256-bit encryption protocol to conceal your identity and information from prying eyes. You might know that it’s the cutting-edge technology so far that secret agencies use for strongest encryption. The “Vigilant Mode” works similarly to “Kill Switch”, it blocks all the unsecured data during connectivity issues. For example; if you’re surfing the web through a protected tunnel and your connection faces interruptions, this feature will automatically prevent all the unsafe traffic. Along with free they also present a premium version which allows unlimited bandwidth and devices. However, free users are limited to 500 MB bandwidth per month, but they can increase to extra 1 GB by sharing a tweet. You can take benefits on 5 different devices together just like Zenmate VPN. It can be installed on iOS, Android, Windows, Chrome, and Mac. TunnelBear’s browser add-on blocks tracing hence improve performance and speedy restricted websites loading. Paid plans don’t come with any refund policy so you must try the free version before buying. IPVanish is one of the top recommendations when it comes to best VPN softwares and my favorite choice to surf the internet anonymously. It offers multiple encryption protocols such as OpenVPN, L2TP/IPsec, and PPTP for most secured and protected browsing experience along with zero log policy. So, you don’t have to worry about privacy while using IPVanish. It’s not only a secured but also fastest VPN to access censored and geo-restricted content worldwide. This Zenmate alternative allows unlimited bandwidth and peer-to-peer downloading without slowing down your internet speed – no throttling. So, you can enjoy favorite TV shows, movies, and websites freely instead of worrying data transfer limits or annoying usage caps. Compared to Zenmate, you get more VPN locations to choose from. There are hundreds of servers located in 60+ countries whereas the competitor provider only supports 30+ countries, enough coverage but less than IPVanish. Regarding usability and flexibility, they accommodate user clients for all major platforms including Windows, Mac, iOS, Android, Linux, Google Chrome, and Internet routers, etc. It is also available for Amazon’s FireTV devices. The software interface is easy to use and deliver lightning-fast speeds across the globe. You can use simultaneously on 5 devices at the cost of just $6.49/month. 24/7 customer support and 7-day refund policy also in place. Cyberghost is a freemium VPN available for both free and premium users. Users can take advantages to conceal personal identity without paying a single penny, but of course, there are limitations on free version such as fewer servers and allotted countries. But, premium plans packed with a whopping 1300 servers located globally in 51 countries. You can analyze network speed before connecting to any server for high speed experience. Like any other VPN, Cyberghost also permits unmetered bandwidth and video streaming. VPN’s knowns as privacy guard and to meet the standards, this one creates no logs, offer all protocols (OpenVPN, PPTP, L2TP/IPsec), DNS/IP leak protection, and secure the connectivity through 256-bit AES encryption. Choosing any protocol is dead simple with the help of gorgeous looking software. After using it for a while, I personally found their PC client is a little bit slow compared to IPVanish, and other VPNs. Besides, Cyberghost also slows down the internet speed drastically which should not be happened especially when you’re a paid user. Companies usually improve their performance, but I don’t what’s happening with Cyberghost. They are not delivering the same speed as it was in the past. Personally, I would say consider choosing any other platform for the fastest VPN service. On the other hand, there are many users who claim that they are enjoying top speed. Chances are it might be a problem with my connection but who knows as I haven’t contacted the support yet. You can install the app on all major OS including Windows, Mac, Android, and iOS, Linux, etc. Premium packages are covered by 30-days money back guarantee. Concerning about technical support, their agents are available 24/7 for instant help by means of live chat and email. The company also maintained a DIY zone where you can find guides, FAQs, and troubleshooting tutorials. Similar to Zenmate, Cyberghost also can be used on 5 devices simultaneously, but it depends on the plans’ nature. For more than 5 devices, they charge extra fees. VyperVPN powered by Chameleon Technology to secure all of your smart devices ranging from mobiles to desktop PC for safe web browsing. It works seamlessly even in the countries where proxies and VPN softwares are banned. So, if you’re living in one of those states then make use of VyprVPN to access censored and private stuff. You can also watch geo-restricted media like TV shows and services (Netflix) by hiding the real IP. For added security, Nat FireWall functionality included in all plans. Plus, you get unlimited switching along with no downloading cap. The company has VPN servers coverage in a wide range of locations (70+ global positions), whopping 700+ instances, and unbelievable 200,000+ IP address to avoid hacking and ISP tracking activities by guarding your real IP. They utilize 256-bit encryption and offering multiple protocols including PPTP, OpenVPN, and L2TP or IPSec to help the users choose appropriate protocols for the desired speed, encryption, and assurance. They have own VyprDNS system which exclusively available for VyprVPN users and being used to propagate different IP addresses. Their experienced staff consists of in-house engineers and tech innovators to introduce and implement the latest technologies for blazingly fast and privacy-focused VPN solutions. You get an astonishing 100% uptime guarantee through state-of-the-art infrastructure and solid network connectivity. VyprVPN is one of the best programs like Zenmate to open any site without spoiling your identity to snoopers and evil eyes. Various buying methods are in place to purchase paid plans along with 3-day test drive (trial period). Support team available throughout the whole year for instant help through live chat and email. Windscribe is another best VPN like Zenmate for bulletproof protection and safe net browsing. Unlike other services, it also restricts annoying advertisements with its built-in advanced technology. They hide your actual IP address and help to open geo-blocked sites as well as country defined media such as TV shows. Its Windflix feature can be a most favorite option for Netflix lovers as it enables watching Netflix from anywhere with outstanding buffering speed. They have coverage in more than 50 countries and right now have 100 cities where VPN servers are located to deliver an unforgettable experience. All of their servers are shielded by AES 256-bit encryption along with 4096-bit RSA key protocol to ensure robust privacy. The notable thing is such security measures doesn’t slowdowns the internet speed significantly as some VPNs do especially free ones. Windscribe does not keep permanent logs but create few for legal usage but don’t worry they won’t reveal your identity or sell it to third party companies. Users can generate configurations for different protocols such as OpenVPN, SOCKS, and IKEv2 to install manually but it’s a premium feature. The free version allows 10 GB monthly data transfer which I think enough for rare usage while paid users can surf unlimited stuff. Windscribe offers user clients for Windows, Mac, Linux, iOS, Android, and other devices. The company also provide extensions like Zenmate for Opera, Firefox, and Google Chrome. Another noteworthy thing is you can install and use it on unlimited devices. Furthermore, their paid plans are highly affordable and priced reasonably. If you are using VPNs for a while, I am pretty sure you’ll be aware of Hotspot shield. Millions of users using this Zenmate alternative to open blocked and geo-limited stuff around the globe. According to the company, 500 million users already downloaded their app and enjoying restriction free internet across the world. You can guess an idea how big their user base is with those numbers. One of the primary reasons for their popularity might be delivering high performance even for free users. So far, they also managed to maintain it, and the other reason is their apps are dead simple to use. Hotspot shield doesn’t require signup or registration to use the free version. All you have to do is install the application and connect to the desired server for reliable tunneling and encrypted browsing. They have hundreds of server to ensure pleasing experience so that the user can connect to the nearest server for fastest rendering. With the help of Hotspot shield, you can hide real IP with a US based one and surf anything anonymously without compromising on network performance. It can be used on Android, iOS, Windows, Mac, and Google Chrome, etc. For flawless experience, it’s recommended to buy a premium plan as it enables more locations and exclusive features. Don’t have money to get premium? No worries, you still get enough servers to choose from as a free user. Prime plans include a 30 day refund period to get your money back in case of unsatisfied scenarios. Their strict zero log policy and untrackable protocols to access censored contents make it one of the best VPN softwares. Searching for an excellent Zenmate alternative for robust security and unlimited data transfer or bandwidth? 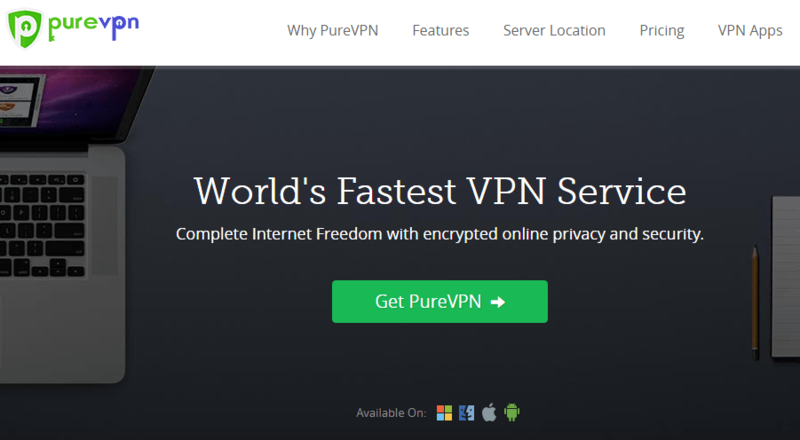 Well, try PureVPN – Top VPN trusted by 1 million+ customers. It has all the vital features and encryption protocols to make your connection private for watching movies, TV programs, and surfing censored sites. You can choose a preferred protocol from OpenVPN, L2TP, SSTP, PPTP, and IKE, etc. for desired encryption and speed within a few clicks with the help of intuitive software. For accessing blocked sites, OpenVPN can be used but for other purposes or peoples who travel in different states can take advantages of other protocols. Kill Switch and Split tunneling are uniques features to restrict unprotected traffic and browse specific sites/services through a secure tunnel and the rest from your default ISP. PureVPN presents a variety of locations globally and servers solely owned by the company to ensure an exceptional level of privacy toward governments, surveillance, and hackers. You can connect with 140 countries, choose from 180 global locations, and more than 750 servers for unbeatable speed regardless of geographical area. So, how they achieved this? The credit goes to guru staff which is capable enough to optimize all machines for lightning fast speed with zero throttling. PureVPN developed apps for different operating systems (20+); Windows, Mac, iOS, Android, Linux, etc. and permits 5 concurrent connections. Their support team assists you 24/7/365 for quick solutions. Last but not least, OkayFreedom is also managed to get listed here as it’s quite similar and free vpn like Zenmate to enjoy private stuff with full peace of mind. Like any other VPN in this list, they also incorporated 256-bit AES protocol to mask the actual IP address and offer multiple server locations so you can stream area-restricted content like Netflix, Hulu, etc. Though they have fewer server positions (19) still you get faster experience than many. It’s available in free as well as premium versions whereas free clients are limited to basic features and tiny 500 MB monthly bandwidth and don’t require registration to use. So, you can only use it for specific things. For instance; while accessing your bank accounts or payment processors. For streaming, it’s insufficient and comes with advertisements. Prime clients get unlimited bandwidth, switching, buffering, and safe torrents downloading too. OkayFreedom’s Premium VPN costs $29.95/year and can be purchased with Credit cards, PayPal, and Wire transfer. You can ask for the refund within 30 days after the date of purchase in case of unstratified scenario. They have no Android or iOS apps whereas Zenmate has an edge in this regard. It’s only available for Windows OS and Google Chrome at the time of writing this article. So, Mac and Linux users consider checking other VPN softwares or simply can use proxies for quick unblocking. Which Zenmate VPN Alternative Should I Use? Now, which alternative or similar VPN service you should choose? Do you have any specific requirements like does a number of servers, encryption protocols, or supported platforms matter to you? or You’re looking for robust and high speed provider with foolproof security? In that case, I would recommend choosing ExpressVPN or NordVPN. Both are just awesome, faster, and deliver military-grade encryption making them the top-notch Zenmate alternative. Their paid plans also priced reasonably and allow multiple connections at the same time to secure all of your devices. Whereas, ExpressVPN and VyprVPN are also considering options to browse Netflix and Hulu from anywhere. They offer thousands of dedicated IPs and hundreds of servers to choose from. Is there any Zenmate alternative or top-class VPN provider I missed? Please feel free to suggest below and share which one you’re using currently to access blocked websites?